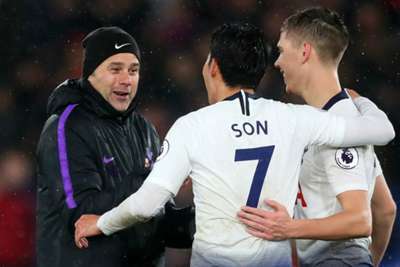 Mauricio Pochettino has hinted he is ready to name a strong line-up when Tottenham take their bid for silverware to Arsenal in the EFL Cup quarter-finals. Pochettino's acclaimed job at Spurs has seen him identified as a frontrunner to replace Jose Mourinho at Manchester United next season, following the Portuguese's sacking earlier on Tuesday. The only significant mark against considering the 46-year-old for one of the most coveted jobs in world football is a lack of major trophies. Despite regularly using the domestic cups to rotate his line-ups, Pochettino insists he shares the desire of Spurs fans to end a 10-year trophy drought and suggested their north London rivals should be ready to contend with strong opposition on Wednesday. "It is an important game but it will be a different game to a few weeks ago," said the Tottenham boss, reflecting on Arsenal's 4-2 derby win at Emirates Stadium earlier this month. "All the teams are going to do many rotations [but] maybe I'll surprise you and not rotate too much." Spurs have lost to United and Chelsea in the semi-finals of the FA Cup in the past two seasons and went down 2-0 to Mourinho's Chelsea in the 2015 EFL Cup final during Pochettino's first season at the helm. The Argentinian tactician was keen to point out the strides his team have made in establishing Champions League qualification as "a normal thing" for Tottenham. But he knows silverware would bring extra recognition. "We were talking with players and it would be fantastic," he said. "Win a cup like this [and] the people will give us the value of what we are doing. "It's true that is about perception and it means a lot one trophy. We are going to try and win at Arsenal. In every single season we try. "In the first season we played in the final against Chelsea but lose. We also played the semi-final against Manchester United. Always we lose the possibility with big side. "We try and only we need some luck. We are going to try again this season to win something."